2019 marks the 30th anniversary of the collapse of the Berlin Wall and subsequent demise of the Soviet Union. It also heralds 30 years since Francis Fukuyama interpreted these events in his essay ‘The End of History’. In this text and the expanded book ‘The End of History and the Last Man’ (1992), Fukuyama argued that the spread of liberal democracy and western capitalism was the end of sociocultural evolution. 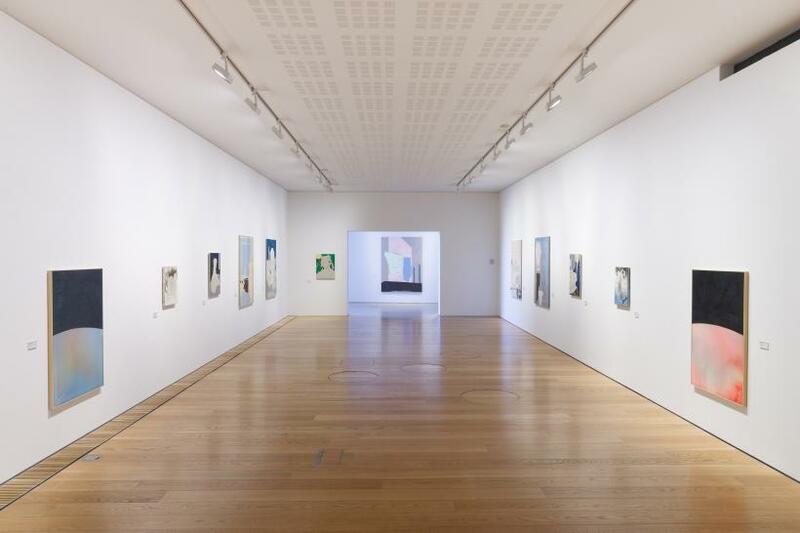 This theory is one of two political and social ideologies alluded to in ‘And the tide was way out’: Paul Hallahan and Lee Welch’s exhibition at the dlr Lexicon in Dún Laoghaire. And while Fukuyama’s much debated, and criticised, hypothesis is a specific view of post-Cold War history, the other is the broader, and much older, concept of utopia. Together the pair conjures a society that is problem free in its ubiquitous system of government, but also one that has stagnated for lack of differing opinions and challenges. It is this, almost inevitable, conflict that resonates loudly in the works on display. In ‘And the tide was way out’ we are presented with two distinct approaches by the artists to painting, and while they converge in two works at the centre of the main gallery space, their divergence dominates the duo exhibition. 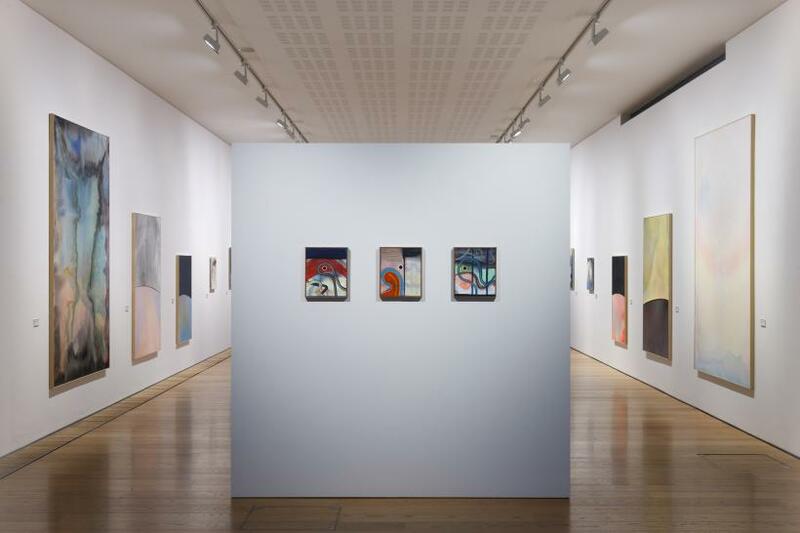 As visitors enter the show, they encounter a freestanding wall that blocks the view of most of the gallery, along with three Hallahan paintings all titled ‘Present bias’ (2019), with the varying suffixes ‘(traces)’, ‘(dreams)’, and ‘(stuck)’. These opening gambits are dreamlike microscopic visions that draw you in and conceal the rest of the gallery. Around the wall, the space and exhibition expand into large canvases that are presented in a rhythmic arrangement, descending on either side of the gallery to a pair of modestly sized paintings that both artists have worked on. After this interlude comes Welch’s half of the show, with a similar rhythmic hang. As a viewer we dive in and pull out, moving through the space with a tempo that adds a performative element to the experience. At the back of the freestanding wall is the only non-painting in the show: a double projection by Hallahan of a swirling mass of colour that ties in with the more immense canvases on display. This projection is luscious in its dreamlike colourscapes of mixed ink and watercolour. In ‘true level digging comes up, goes down’ (2019) we find a Rorschach test-effect questioning our perception, which nods in its title to the 17th century English anarchist group and the 1960s community-action group in San Francisco, both called ‘diggers’. This idea of dual interpretations carries through the show. In contrast to Hallahan though, Welch has adopted a sparser approach to painting, choosing to reveal sections of canvas and making careful use of them. This is most effective in ‘through the abundance of its pasts’ (2019) where a checkerboard cotton surface forms clothing and other objects within the work itself. 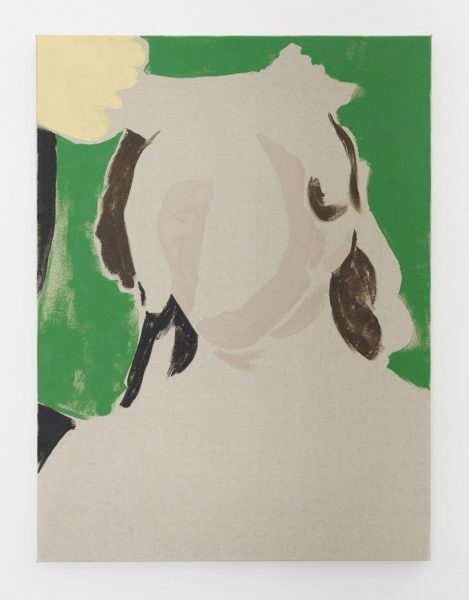 Both artists highlight their choice of material; Welch by displaying naked polyester and Hallahan through double canvases, which seem to envelop one another. Each artist also uses lyrical titles to evoke a story, only to leave them hanging in mid-air for the viewer to complete. At the back of the gallery, Welch draws visitors towards a monumental painting titled ‘and being swept along is not enough’ (2019). In this work we discover references to architecture and elements of art history that are continued in other paintings such as ‘like light and cloud-shadows’ (2019) – an homage to Gabriele Münter’s ‘Girl with a Red Ribbon’ (1908). Welch pushes and pulls the viewer in different directions, but is careful to never force them down any predetermined rabbit holes. The dlr Lexicon is primarily a public library and community centre, but it is also a building that dominates its surrounding, thrusting 30 metres out of the ground in a suburban coastal town. To get to the gallery, visitors must first snake their way through the building and the library itself. This passage increases the space’s organic footfall, which the artists have harnessed not only as a place to display their artwork, but also for community engagement. Events, like tarot readings by Welch and watercolour workshops for young adults by Hallahan, are organised alongside a selection of accompanying books – including David Foster Wallace’s ‘Infinite Jest’, whose last line provides the title for this show. When viewing an exhibition that features two artists, we are often eager to first, untangle both halves of the conversation, and then see how they stitch back together. In ‘And the tide was way out’, visitors are drawn back to the opening theories of utopia and the perceived end of history. Both are fatally flawed; true utopia is impossible and Fukuyama’s theory that globalisation was the final form of government has collapsed due to the rise of populism. The parallels and contrasts in the show amplify the contradictions between these two artists, while also providing subtle clues to their inner thought processes and monologues. Though this approach leaves ample room for interpretation and enjoyment, the two artists struggle to materialise as a duo.